Scholastic has released a new report today that shows a significant increase in ebook adoption among US schoolkids. 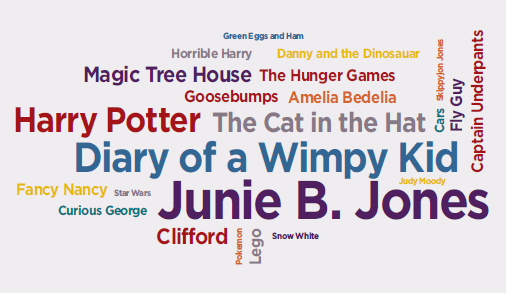 According to the fourth edition of the Kids & Family Reading Report, almost half of the kids participating in the survey reported that they'd read an ebook, up from 25% of kids who reported the same when this survey was last conducted in 2010. The full report is available as a free PDF. I'd recommend the version without the appendices; I can't download the other one. This publisher of academic content runs this survey on a biannual basis and it offers some results which are startlingly different from the recent report from the Pew Research Center. According to Scholastic, 46% of kids in the US have read an ebook. The survey also showed that 41% of parents have read an ebook. These stats are very different from PRC's own figures which show that 23% of US consumers had read an ebook. The most used reading device was the laptop, and it won out over tablets, ereaders, and desktop PCs (22%, 21%, 19%, 19%). Elsewhere the report shows a jump in the number of children who reported they would read more books for fun if they had greater access to ebooks (49%, up from 25% in 2010), as well as a marked difference in gender preference with more boys than girls reporting that they are reading more ebooks for fun (26% vs. 16%). 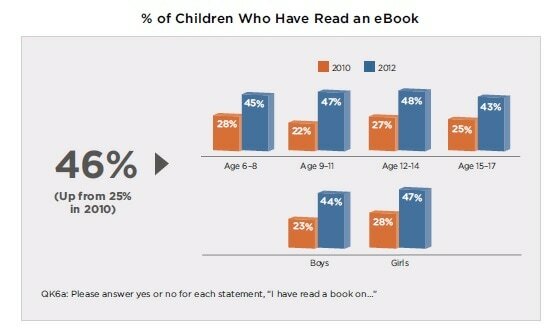 On a related note, 31% of parents reported reading more ebooks for fun. But even with that increase in popularity, paper books still dominated the kids' pleasure reading with 4 out of 5 preferring print over digital. What's more, 58% of kids said they would never read an ebook a figure which dropped slightly since 2010 (down from 66%) . Battery life and sharing are 2 of the top reasons kids gave for preferring print, while portability and easily accessible content are the most common reasons given for preferring ebooks. Kids also listed the dictionary and note-taking features found in most ereaders as the features they like the most. Parents, on the other hand, liked the embedded videos and read aloud features found in some ebooks, and they too agreed that portability and easily accessible content were the best reasons to adopt ebooks. Is there any report available about tablets being more popular than ereaders among those kids that are used to read ebooks? I think I read somewhere over the internet a few days ago that tablets are already the preferred choice among e-book crowd. Laptops won out over tablets, ereaders, and desktop PCs (22%, 21%, 19%, 19%). The numbers are closer than I thought. Thanks for the statistics.